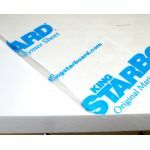 Buck Woodcraft offers full, uncut half and full sheets of King Starboard at competitive prices, in thicknesses from 1/4" to 1-1/2". Buy 2 half sheets of the same color and thickness and get our full sheet price. Or buy 3 or more full, uncut sheets of any size or thickness combination and receive a quantity discount.